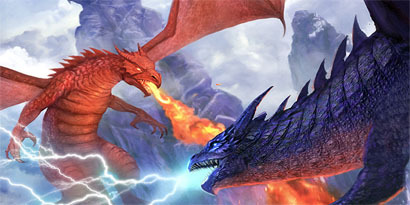 Tournament games are 4 players per table on a half folded map Each round lasts a maximum of 1 hour or until 2 dragons are eliminated. The survivor move on to play against other survivors and the eliminated play against others who have been eliminated. At the start of each game the dragon you are playing is selected at random from the game dragons. Final Sword Productions is please to sanction tournments. Anyone who wishes to run a Battle Skies tournment needs to contact admin@battle-skies.com. Sanctioned Tournments will be posted here as soon as we have the information.